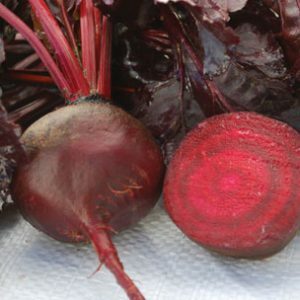 The Chioggia is an old time Italian heirloom beet! The first thing you notice about Chioggia beet is the unique bull’s eye pattern it displays once cut. Not only is it the most beautiful of the beets but it has delicious sweet flavor. Dates back to the early 1800’s from the Italian fishing town Chioggia, near Venice. Produces tasty green leaves that are similar to spinach in taste. Beet has pale red skin and grows to 2-3″ wide. Best eaten young when most tender and sweet. Beets are a unique root vegetable edible for both its bulb and green tops. The vegetable is a biennial, which means they flower and seed in their second year of growth, but beets are typically grown as an annual. Before Planting: Beets grow quickly in light or loamy soils with a pH over 6.0. In general, cool temperatures produce the best flesh color. Weather temperature fluctuations will cause white rings in the roots. Planting: Begin sowings when soil has warmed to 45°F. Sow 12-15 seeds/ft. 1/2″ deep, rows 14-18″ apart. Thin to 1 plant per 2″ when true leaves begin to show. 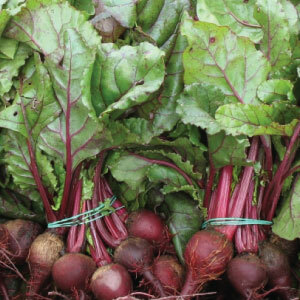 For a continuous supply of greens and small tender beets, sow seed at 2-week intervals until 8 weeks before regular heavy frosts are expected. Sow seeds 4-6 weeks before transplanting out after heavy frosts have decreased. Sow seeds 1/2″ deep, 2-3 seeds per cell. Transplant out 3″ apart in rows 14-18″ apart. Watering: Since beets consist of mostly water, the plant requires adequate watering to grow. Water beets at least an inch weekly if rain doesn’t supply enough moisture. Water slowly to permeate the soil and reach the root. 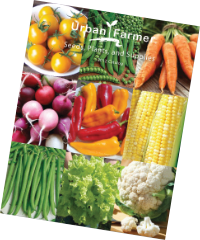 Fertilizer: Apply some high-nitrogen fertilizer six weeks after planting. Days to Maturity: 14-21 days to have transplant ready. Then see days to maturity for each variety. Harvesting: Sow about 10 weeks before heavy freeze is expected. 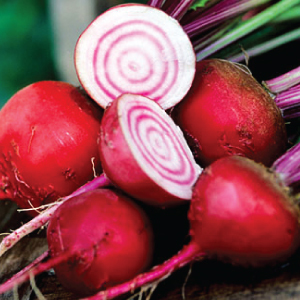 Dig under beet root and lift plants tops, wash, and store 6 months at 32°F and high humidity. Wash and put in cool location. Store cool and high humidity for best results. Tips: Though beets can grow in partial shade, their roots may run into tree roots, so plant in deep soil. AVG. Seeding Rate: 1M/66′, 5M/333′, 436M/acre @15 seeds/ft. and 18″ between rows.